The word solar is an adjective. Solar means (1) relating to or derived from the sun or utilizing the energies of the sun. The following articles and web pages elaborate on the word solar. Browse this solar energy company directory for information about solar energy contractors in the United States of America. 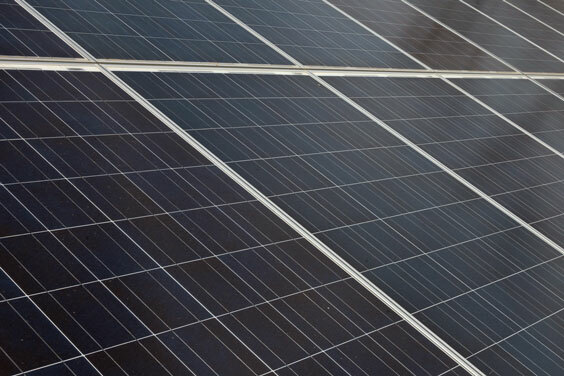 The photo on this page depicts solar energy panels with photovoltaic cells, on a sunny day. Solar water heaters can be used to heat swimming pools and hot tubs, or provide water for an entire family's needs. Both passive and active solar water heating systems are available. This guide to energy provides an overview of the industry and helpful links to oil and gas companies, solar and wind energy systems, and energy conservation firms. NERL is the nation's primary laboratory for renewable energy and energy efficiency research and development. It is the major laboratory for the DOE and began in 1977 as the Solar Energy Research Institute. The website provides information about NERL, visiting, and doing business with them. The Planetary Society, founded in 1980 by Carl Sagan and others, is the world's largest space-interest group. The Society is the dedicated to exploring the solar system and seeking life beyond earth. The Society sponsors research projects, educates the public about space issues, advocates for space science research funding, and more. Visitors to the website can find out how to join the Society. The SpaceWeather site contains news and information about the Sun-Earth environment. The site contains NOAA weather reports in various parts of the world, information about near-earth asteroids, space weather, a photo gallery, aurora alerts, information about solar telescopes and night-sky cameras, and more. Four Seasons Solar Products was founded as a green house supplier in 1975, and has become a well-known manufacturer of seasonal greenhouses, florida rooms, and screen enclosures as well as year-round sunrooms, solariums and conservatories. The following articles provide recent solar-related news. Reuters. Wednesday, 24 Apr 2019 19:43:46 -0400. Science Daily. Wednesday, 24 Apr 2019 10:22:44 EDT. Zacks Equity Research. Zacks. Wednesday, 24 Apr 2019 14:13:00 GMT. Brandon Specktor Senior Writer. Fox News. Tuesday, 23 Apr 2019 16:14:35 GMT. Yahoo. Tuesday, 23 Apr 2019 08:02:11 -0400. Smithsonian. Monday, 22 Apr 2019 13:00:00 +0000. CBS News. Monday, 22 Apr 2019 10:54:38 +0000. By John Parnell, Contributor. Forbes. Wednesday, 17 Apr 2019 21:22:00 +0000. ABC News. Wednesday, 17 Apr 2019 10:01:11 -0400. The following digital image illustrates the word solar.